Microbial ecology of natural and technical systems. Biofilms and other spatially structured and heterogeneous systems. Activity and physiological adaptation of microorganisms under various conditions (starvation, stress, predation, symbiosis). Consortia of aerobic and anaerobic bacteria and their physiological and metabolic interactions. Interaction of microorganisms with invertebrate hosts. Associations and interactions of bacteria and fungi. Metabolism of anaerobic and aerobic microorganisms (degradation potential, biosynthesis of secondary metabolites). Diploma thesis at the chair of "Microbial Ecology" (Prof. Dr. N. Pfennig) at the University of Konstanz, Germany. Subject: "Anaerobic degradation of phenol and hydroquinone"
Dissertation at the chair of "Microbial Ecology" (Prof. Dr. N. Pfennig), University of Konstanz, Germany. Subject: "Assessment of the behavior of anaerobic bacteria at surfaces"
Lecturer (General and marine microbiology) at University Gothenburg, Sweden. Subject of audition lecture: "Microbial degradation of recalcitrant molecules"
ISME (International Society of Microbial Ecology). Investigation of Biofilms, Flemming H.-C., Griebe T., Szewzyk U. (eds). Technomic, Lancaster 2000. 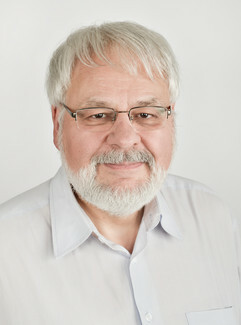 Wasser: Chemie, Mikrobiologie und nachhaltige Nutzung, Grohmann A.N., Jekel M., Grohmann A., Szewzyk R. und Szewzyk U., Gruyter, 2011.